Carlton Court has five of the most beautiful luxury apartments in London that you could ever wish to see. They are situated in the heart of Mayfair, just off Piccadilly so everything is literally right on your doorstep. Everything is within walking distance which is wonderful, because getting taxis in central London is not the easiest thing to do, and the roads are very crowded anyway. Of course, if you need to venture a little further, the underground system is also to hand, with Hyde Park Corner Station and Green Park Station very close by. Talking of parks, if you like to go for a morning stroll, Green Park is right opposite the end of Down Street which is where Carlton Court is located, or if you want a longer walk Hyde Park is very close as well. There is also a stables in Hyde Park and you can hire a horse and go for a ride along Rotten Row. You can walk across Green Park and you come out at the top of The Mall right outside Buckingham Palace. Also very close to Down Street is Shepherd Market which is an 18th century square with a village-like atmosphere – right in the centre of London! It has pubs, restaurants, and boutique stores selling clothing, food, jewellery, and gifts. In Carlton Court we have five apartments – two one bedroom ones for two people, a two bedroom duplex and a two bedroom deluxe, and a three bedroom flat which sleeps up to six. There is a 24 concierge and security service together with a housekeeping/maid service seven days a week. Staff speak a number of different languages including Arabic, Japanese, Russian, and French. Every room in Carlton Court has a top grade TV set, and WiFi is provided as standard. Each apartment also has air conditioning (it gets hot in London in the summer) and underfloor heating. The state-of-the-art kitchens are fully fitted and have a dishwasher, washing machine, and tumble dryer. 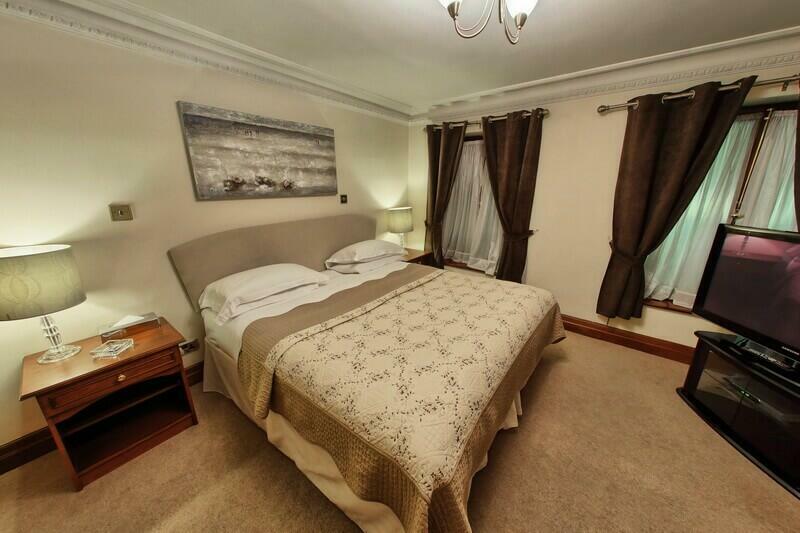 The double beds are king size, but we can provide cots on request. There is ample cupboard space, and all bills are included except for your telephone calls for which we provide you an itemised bill.